Holiday tables in Greece are loaded with more food than is possible for assembled family members to eat. Every square inch of table is covered with food-laden plates and bowls. I’m happiest when seated near a plate of garlicky meatballs, which diners spear off the serving dish with their forks. 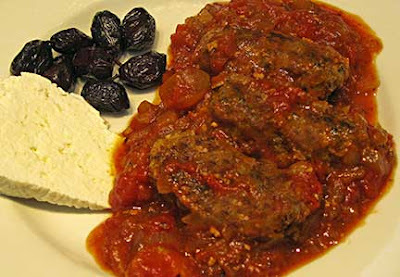 Sometimes the meatballs are round and fried (keftedes), and occasionally they are shaped into oblong sausages, seasoned with cumin, and served in tomato wine sauce. These sausages are called Soutzoukakia, and are one of my favorite dishes. Greeks settled Smyrna (now the Turkish city of Izmir) in the 11th century BCE. Smyrna remained important to Greece for over 3000 years, even though its government was controlled at various points by the Greeks, the Persians, the Roman Empire, the Byzantine Empire, and the Ottoman Empire. From its settlement until 1923, Smyrna remained home to a large Greek population. Following the 1923 Treaty of Lausanne, the entire Greek population was ejected from Smyrna and forced to seek refuge in new countries. Most went to Greece. The displaced Smyrna residents brought their customs and cuisine with them to their new homes. Soutzoukakia is one of the dishes that originated in Smyrna, and remains a popular menu item in Greek homes and tavernas today. I started ordering Soutzoukakia (soo-tsoo-KAH-kyah) whenever I could, initially because I liked the way the word exploded out of my mouth and later because I was hooked on the taste. After years of eating it, I consider myself a Soutzoukakia connoisseur. I’ve had Soutzoukakia made with ground beef, lamb, and pork, or a combination of two of these meats. I’ve had it moist and tender, but also dry as dust. I’ve had it seasoned to perfection, and I’ve had it so bland that even a Peoria grandmother would eat it without complaint. It’s been served by itself, with rice, or with fried potatoes. Although Soutzoukakia is translated as “Smyrna sausages,” most North Americans would call them meatballs. They are not in casings, as are typical sausages, and their ingredient list mirrors that of meatballs. 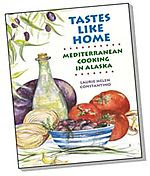 In an early edition of his famous cookbook, Nikolaos Tselementes (in Greece, his name is synonymous with “cookbook”) instructs his readers to use the same ingredients as they would for regular meatballs, but with cumin and garlic added. My version of Soutzoukakia follows. I use a combination of beef and pork, which results in juicy, flavorful sausages. I don’t use breadcrumbs, as is called for in many recipes, because I prefer Soutzoukakia’s texture without it. The sausages are robustly spiced; the tomato sauce is not; the contrast is pleasing. Please click on over and visit my new site. Thank you! Your Soutzoukakia (and sauce) look bang on in the last photo and it's good that you shared the plight of Smyrna with your readers. I have added this to my evergrowing list of things to try! !Thanks for the great read!! Yum! I love soutzoukakia though I've never made my sauce with honey. Sounds like a good change of pace so I'll have to give it a whirl next time I make them! Yours look beautiful. it's like you read my mind — I have ground pork and beef out and was thinking of a feta/spinach flavored meatloaf (quasi-Greek), but this sound so much more interesting! And it will give me another chance to use the Aleppo pepper I used for the 1st time with the plasto. Thanks, Laurie! That looks and sounds wonderful - both the first time and the leftovers. I love spicy food/mild sauce combinations. Save me a place by them at the table, please. Laurie, Your "Greek meatballs" sound and look gorgeous! I especially like the last photo. A very Happy Holiday season to you and yours! I tried them once and I didn't like the taste of cumin, so I never put cumin in again. Actually cumin is what makes soutzoukakia differ from meat balls. Thanks to you and other blogger friends who use lots of herbs and spices I tried cumin recently in a recipe and it was excellent. Can't wait to make soutzoukakia soon and add cumin!! Peter, that bread got eaten really fast - I guess it's time to make more! Valli, if you do make it, I hope you like it! Elly, the honey in the sauce really sets off the cumin in the soutzoukakia. Thanks for the complement! Threetastes, I love the mixture of ground beef and pork - so much better than either one on their own. In Greece, they never serve it ground and always grind it in front of you. Now that is a custom I'd like to import! Katiez, there's a chair for you anytime! Ivy, yep, it's the cumin that separates soutzoukakia from meatballs. I'm glad you're giving cumin a second chance, because it is so good in these. I'm also glad to be a good influence regarding herbs and spices which, as you know, I use with abaondon!